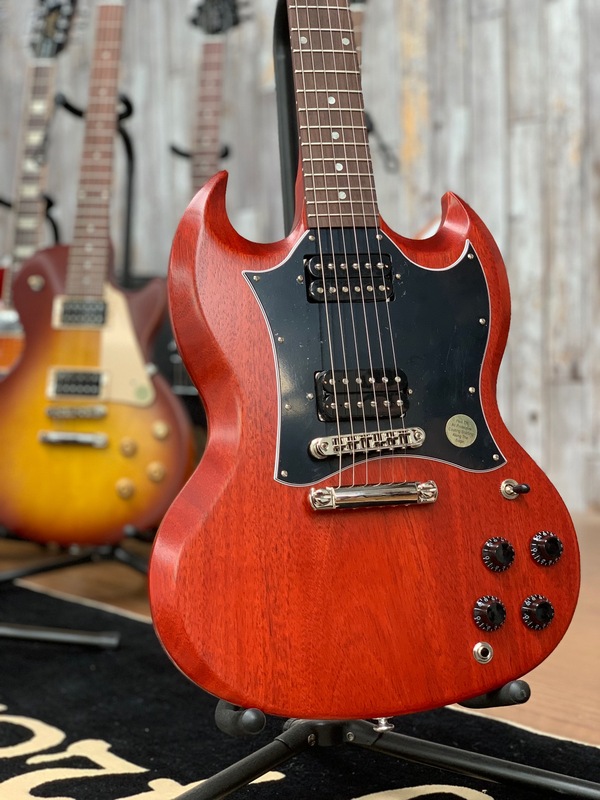 Part of the New 2019 Gibson Guitar Range, is the Gibson SG Standard Tribute Vintage Cherry Satin 2019 model. Which is part of the SG Tribute Series. Available in Vintage Cherry Satin, and Natural Walnut Satin the new 2019 SG Standard Tribute boast a traditional Mahogany body and rounded profile maple neck with rosewood fingerboard. Finished with a black, 5-ply full-face pickguard loaded with double black, open-coil 490R and 490T pickups giving the 2019 Gibson SG Standard Tribute its voice. Nickel hardware and Vintage Keystone tuners finish off the SG Standard Tribute. This guitar has a Mahogany Body, Rosewood Fretboard, and utilises 490R Neck Pickup & 490T Bridge Pickup with Vintage Deluxe Tuners with Keystone Buttons.